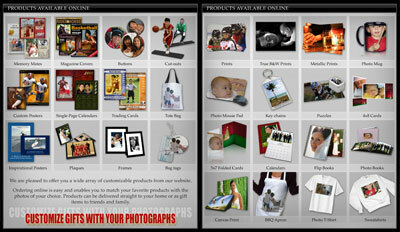 Product posters are a great way to promote all the products you sell while at an event. Many of our clients like to pre sell coupons or hand out promo dollars to entice online sales. Visit the marketing section to download poster files. This entry was posted on Monday, February 15th, 2010 at 2:38 pm	and is filed under Blog. You can follow any responses to this entry through the RSS 2.0 feed. You can leave a response, or trackback from your own site. Look forward to trying them out. Do you make hand outs or a smaller version of the product list with photos? Sorry for the delay in getting back to you here. Had a little issue with the blog posts as we are moving blog over to another service. These can be produced page size for sure but let us know if you have something else in mind we will be glad to help.